Sky Haven Temple was a large Akaviri fortress built among the mountains of The Reach in Skyrim. During the First Era it was inhabited by Reman Cyrodiil's Dragonguard and served as an outpost in their crusade against dragons. By the late First Era, the Winterhold Rebellion took place in protest to forced conscriptions that were being imposed on the local populace. The Dragonguard stationed at the temple disobeyed Emperor Kastav's orders to suppress the rebellion, on the grounds that it violated their Oath of Allegiance. In their stead, Kastav sent an Akaviri commander named Kalien, who sacked the city the following year. The sacking resulted in the local Nords laying siege to the temple, as they did not distinguish between Akaviri. The siege was eventually lifted shortly after the accession of Reman II as Emperor. The new emperor later visited the temple as part of his first visit to Skyrim in 1E 2806, to which the Dragonguard provided the honor guard. 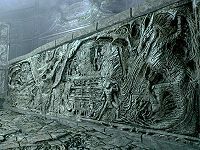 In 1E 2812 Emperor Reman II permitted the construction of Alduin's Wall within the temple. Considered to be a wonder of the ancient world, its purpose was to record the accumulated dragonlore and prophecy that the Dragonguard possessed at the time. Its main focus was a pictorial representation of the Prophecy of the Dragonborn. The prophecy foretold of five key historical events that would preface Alduin's return after his expulsion during the Dragon War. Given that Alduin's return was inevitable, the Dragonguard believed that the wall was their gift to the generations that were to follow. Craftsmen from temples across the Empire were called upon to work on the wall and after six years it was completed. Emperor Reman II returned to the temple in 1E 2818 to officially dedicate the wall. The Blood Seal outside the temple was consecrated in the presence of all Akaviri Dragonguard in Skyrim. This allowed the temple to be sealed, only ever to be opened by a Dragonborn to unlock its knowledge and power. As the eras passed and the original mission of the Dragonguard was forgotten, the temple was eventually abandoned, though it may have been used by the Blades as late as the Third Era. By the Fourth Era, it had become another inaccessible ruin with Forsworn squatting around its outskirts. Following the return of Alduin in 4E 201, the Last Dragonborn travelled to the ancient temple with the aid of the last remaining Blades to acquire the lost knowledge needed to defeat him. This page was last modified on 21 October 2018, at 07:54.